During it’s first year the Reign of Terror of the bolsheviki lead to a significant increase of refugees, who were called `White emigrants‘. The following groups of Russians came to France, to settle there temporary or permanently: -The Russian soldiers of the French and Macedonian front, who did not want to return to their native country; -The soldiers of Denikin’s and Vrangel’s White Army, who were embarked in the ports of the Black Sea, and looked for political asylum in the West, particularly in France, the only country that had recognized the Vrangel administration; -Russian citizens who rightly feared for the measures of the new authorities: people with property, people who could read and write, industrialists, professionals, the landed gentry, high officials, clergymen, Ukrainian nationalists, mensheviki (or members of other non-bolshevist parties, like Social Revolutionaries and Constitutional Democrats – KaDets). The majority of these refugees had left Russia by way of the Southern borders. Many people travelled via Constantinopel and hesitated to go to the West, because they kept hoping that the Revolution would end soon, so that they could return to their native country. One group took recourse in the Côte d’Azur, where the climate much resembled the weather conditions in the Crimea, which before the war was the popular holiday resort of many wealthy Russians. Some very rich refugees even possessed villa’s in the Côte d’Azur, or they rented one. The physicians, lawyers, photographers, writers and artists tried to practice their old professions in France, but the majority was forced to look for odd jobs in Paris (like cab driver, waiter, office clerk, et cetera). Many former soldiers enlisted the Foreign Legion. Almost everyone had a hard time of it. Misery was increasing and many Russians, who in their home land had known comparative wealth, lived in bitter poverty. Most members of the intelligentsia (writers, artists), who had given the development of the Soviet- Union a fair chance, but absolutely rejected the fact that state officials controlled their work, arrived from halfway the 1920s until and the early 1930s. The majority of the Russian élite grouped in Paris, which in the interbellum became the cultural and political center of the Russian diaspora. Until 1940 this group led a very active social existence. They founded schools, churches, unions and social institutions, and organized conferences, concerts, fund raising balls and theatrical performances. Paris might have been the capital of the Russian emigration, but initially Berlin was the literary capital, while Prague became the most important academical city of the Russian emigrants. In these cities, but also in Sofia, Belgrade, Warsaw, Tallin and Riga, lived thousands of Russian refugees. In Berlin was a large Russian writers’ colony, and there was a House of Arts, where Soviet writers and emigrants could meet. In the 1930s these activities receded significantly. Eastern Europe became unsafe, communism and fascism were pressing onward, and once more many Russians had to flight. The only Russian emigrants’ paper that was left in Berlin, was Petropolis. The Committee of the Zemstvo’s was founded in 1921. This committee was engaged in various forms of assistance to Russian refugees, like the education of Russian children, financial aid of agricultural projects of Russian refugees, and scholarships to adults. In the scholastic year 1929-1930 the committee administered 65 institutions (schools, boarding-schools, orphanages and recreation grounds), for the benefit of 2,500 children. In 1930 the committee was merged with the `Union of Zemstvo Members Outside of Russia’, which was resided on the address 6 Rue Daviel, and was headed by chairman Nicholas Avksentiev. The union was the umbrella organization of 102 Russian social institutions. In the early 1920s Montmartre was the quarter where one Russian cabaret after another was established. On October 22, 1922 the Château Caucasien was renamed Caveau Caucasien (54 Rue Pigalle), with a new interior, the gipsy choir of Dmitri Poliakoff, and the singer Nastia Polyakova. Tout Paris visited the establishment. The example was soon followed by the Yar (63 Rue Pigalle) and La Troïka (26 Rue Fontaine), which opened their doors for the public in 1923. In 1926 there were more than a hundred Russian cabarets, restaurants and cafés in Paris. On the address 79 Boulevard Saint-Michel in 1923 the Committee for the Protection of Juvenile Russian Students Outside of Russia was founded, in which some existing organizations for Russian emigrants were merged. In the academical year 1929 360 scholarships were subjected to Russian youngsters, and they had two apartment-houses, in which 75 students were put up. Chairman of the committee was Michael Feodorov. In the same building the National Russian Committee was resided, of which Antoine Kartashev was chairman. From 1921 more than forty Russian professors were engaged by the University of Paris. Professor Nicholas Kuhlman (1871-1940) was chairman of the Russian department of the literary faculty. In 1941 this department was closed down by order of the Germans. In the early 1920s, on the corner of the Closerie des Lilas, resided the Café de Port-Royal (22 Avenue de l’Observatoire), where the literary and artistic circle `Right Across’ gathered. Many young Russians were member of this group, among them the poets Ginger and Poplavsky, and the plastic artists Krémègne, Lanskoy, Pougny, Tereshkovich and Zadkine. The ACER (Christian Union of Russian Students) was founded in 1923, by Vasili Zenkovsky, who was appointed chairman. In 1926 the union moved into a part of the premises of the YMCA, 10 Boulevard du Montparnasse. In 1928 the garage was rebuild into a Russian-Orthodox chapel. The ACER was a center of cultural and religious activities. In December 1931 the Russian study center KIR was founded in the building, and until 1939 it organized many conferences. The Russian culture center (KRK) functioned there from 1933 to 1939. The building also put up the Russian Institute of Technology, and a cafeteria for needy Russian unemployed. In 1935 the ACER moved to 91 Rue Olivier-des-Serres, where the activities were widened. A magazine was found, Le Messager de l’ACER, which started a campaign with the name of `Aid to the Religious Population of the Soviet-Union’. In October 1936 the church Présentati- on-de-la-Très-Sainte- Vierge-au-Temple was opened in the building, which inspired Vladimir Volkoff, son of a Russian emigrant, to write his novel Le retournement (1979). Grand Duke Nicholas Nikolaevich Romanoff lived from July 1923 to October 1929 in Santeny (Val-de- Marne), in the Chƒteau de Choigny. 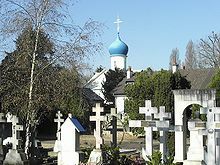 There he founded a Russian-Orthodox chapel, where the Cossacks of his former regiment sang on Russian-Orthodox feasts. Late 1923, early 1924, a group of former teachers of the Imperial Russian conservatories founded the Russian Conservatory of Paris. At first the conservatory was resided in the Rue de Douai, and later in the Avenue de Tokio, but in 1932 they moved into the present premises on the address 26 Avenue de New York, where the institute was renamed Conservatoire Serge Rakhmaninov. On May 7, 1933 there was a reception in honour to the 60th anniversary of Rakhmaninov. Rakhmaninov himself, the honorary chairman of the conservatory, was welcomed by the director, Prince Serge Mikhaïlovich Volkonsky, a friend of Diaghilev. Before the Revolution Volkonsky was director of the Imperial theatres; he came from a family of Decembrists. The Committee of Russian Organizations was founded in 1924, to see after the legal and financial interests of many Russian unions and foundations. The committee was resided on the address 3 Rue Nicolo. At first the committee was the umbrella organization of 67 organizations. In 1929 175 institutions were part of the committee, but in 1936 this number had risen to 325. On July 18, 1924, the day of St. Sergius, the protestant church on the address Rue de Crimée was bought for the amount of 321,000 francs, and renamed `Colline Saint-Serge’. The money was gathered by the Russian community of Paris. On March 1, 1925 the Russian-Orthodox church was consecrated by Metropolitan Evlogi, and at the same time the Russian-Orthodox Theological Institute of Paris was founded. On April 30, 1925 the first lectures were given. Professor Antoine Kartashev, who before the Revolution was engaged by the Theological Academy of St. Petersburg, spoke about the history of the primitive Church. Saint Sergius is a world famous theological institute,and it did pioneering work, particularly as an intermediary between Orthodox and non Orthodox people. Three professors of the institute, father Grigori Florovsky, father Alexander Shmeman and father Johan Meyendorff, emigrated to America, where they played an important role in the development of American Orthodoxy. From 1925 the Society of Young Russian Writers and Poets, also known as the `Russian Club’, weekly, and sometimes more often, organized literary evenings on the address 79 Avenue Denfert-Rochereau. Numerous Russian writers held lectures there, among them: Teffi, Zayitsev, Khodassevich, Shestov, Shmelev, Berberova, Grigori Ivanov, Terapiano, Tsvetaeva and Prince D. Sviatopolk-Mirsky. The last enters of Diaghilev’s Ballets Russes in Paris were from 1926 to 1929, in the Théƒtre Sarah Bernhardt, 12 Place du Chƒtelet, nowadays the Théƒtre de la Ville. From June 27, 1927 Pas d’acier of Serge Prokofyev and Grigori Yakulov was performed, with Lyubova Chernisheva and Serge Lifar in the leading parts. From June 12, 1928 there was the performance of Strawinsky’s Apollon musagète. The choreography was done by George Balanchine, and Serge Lifar interpreted the part of Apollo. On May 21, 1929 was the première of Le fils prodigue, with music by Prokofyev and the choreography once more by Balanchine. Serge Lifar was in brilliant form in the leading part. `Rakhmaninov was sitting on the first row and showed his appreciation several times,’ Prokofyev wrote proudly in his memoirs. In 1933 Balanchine left for the United States; Strawinsky settled down there in 1939. Diaghilev died in 1929. Late 1929 the Union of Russian Cab Drivers, which had more than 1,200 members, took residence in the premises 65 Rue Letelier. Many Russian cab drivers had been officers in the Imperial Army. Just before World War II there were more than 3,000 Russian cab drivers, but in 1945 less than 1,500 were left. A postcard from Alexis Tolstoy, sent to the address of the café, directed towards `The badly cut gentleman’, was handed over to Ehrenburg without any hesitation. Before he returned to Russia in 1923, Alexis Tolstoy often visited the Closerie. He wrote his L’enfance de Nikita there, and the first part of his trilogy Le chemin des tourments. 1921 February 14: Because Evgenia Demidova’s husband has friends in the United States, it’s not difficult to become affidavits. They emigrate to New York, where her husband finds work in a hospital. March 1: Moshe Goldstein’s newspaper Posledniya Novosti (The Last News) was initially independent, but since today it is the official organ of the Constitutional Democratic (KaDet-) Party. The historian and politician Paul Nikolaevich Milyukov, one of the founders of the party, is now editor-in-chief. He can count on the co-operation of almost all Russian writers and journalists who reside in Paris. On the ground floor of the premises is the café Dupont, where the staff of the newspaper often drinks a cup of coffee or a beer. March 17: Bloody oppression of the Kronstadt rebellion. In 1917 the bolshevists promised the navy men in Kronstadt economical, political and social reforms, if they only would take part in the Revolution, but after the Revolution the navy men saw that Lenin was just another dictator, a Pugachov, and that they had been fooled. During their rise hundreds of sailors are executed. From June 5 to June 12 300 persons take part in the European Conference of the National Russian Union in Paris, and Antoine Kartashev is elected chairman. He gave a lecture, titled `Free Russia of the Communist Slavery’ and a National Committee for this purpose was founded on the spot. The Conference takes place in the H“tel Majestic, 19 Avenue Kléber, where many Russian writers read from their own work. July 21: Count Anatol Feodorovich Buxhoeveden (1844-1921), member of the former Imperial Council, who lived in exile in Helsinki, Finland, since 1918, dies. His son Alexander and his family move to Paris. He takes his mother, Countess Maria Buxhoeveden, née J”ggiges, with him. August 2: Famine strikes thirty million Russians. Lenin asks the world for help. From Alexandra Rakhmanova’s diary: August 14, 1921: It was difficult to say goodbye to Omsk. August 15, 1921: The train moves slowly, passing endless deportation trains from the famine areas of the Volga and the North. The cattle trains are crowded with people, piled up like coal: men, women, children. But are this still people? Many of them lost their teeth, their gums are bleeding, their faces are green and ash-gray. August 21: The poet Alexander Blok has passed away in Petrograd! In the café Camél&e- acute;on, 146 Boulevard du Montparnasse, Paris, the gathering of the Putskamer, a group of Russian poets of the new generation, in which particularly Alexander Ginger (1897-1965) plays a creative part, is entirely dedicated to the Russian poet. From Alexandra Rakhmanova’s diary: August 22, 1921: In the early morning we returned to the city we left in a panic on June 9, 1919. August 24: The bolsheviks accuse Patriarch Tikhon and the other leaders of the Church of having contact with the emigrés, which is strictly forbidden by Soviet legislation. At the invitation of the Patriarch of Serbia, escaped Russian bishops hold a Council at Sremsky-Karlovci in Yugoslavia, at which a temporary ecclesiastical administration for Russian Orthodox in exile is worked out. The Synod is headed by Anthony Khrapovitsky, formerly Metropolitan of Kiev, and adopts a resolution to restore the rights of the Romanoffs to the throne of Russia, by which the speakers hint that the leaders of the Russian Church in Moscow share this opinion. That’s why the bolsheviki accuse Patriarch Tikhon of treason. September 15: Baron Roman von Ungern-Sternberg is sentenced to death. This so-called `White’ General conducted a veritable reign of terror in Mongolia, from January to July. He was financially supported by the Japanese government, which appreciates the anticommunist points of view of the `White’ General. After he conquered Mongolia, he crowned himself `Tsar of all Russians’, and braced himself to crush the Red Army. That didn’t turn out as well as he planned, because his troops rose in mutiny and the Red Army brought him to Novosibirsk, to be tried. During the trial the Baron stated, `For thousand years the Ungerns have been in command. We have never taken orders from others. I refuse to acknowledge the authority of the working class.’ September 18: John Mott founds the YMCA-Press in Prague. His publishing-house is specialized in Russian literature. October 26: The Russian writer Zinaida Hippius (1869-1945) and her husband Dmitri Me- rezhkovsky (1865-1941) write the anticommunist pamphlet The Empire of the Antichrist. November 5: Birthday of my grandmother Princess Alexandra Constantinovna Obolensky, née Countess Mussin-Pushkin. Nobody heard anything of her since November 1917. This day she would have become 36. December 23: Prince Michael Feodorovich Obolensky, my grandfather, is murdered by the bolsheviks in a Moscow prison. 1922 From Alexandra Rakhmanova’s diary: January 10, 1922: I’m now in the maternity ward, for the third day… It’s a boy, we named him Jurka-Alexander… I am still much too weak and it’s hard to write. January 11: Metropolitan Anthony asks the Synod to openly choose the side of the Whites. The Soviet government accuses Patriarch Tikhon of having contact with the Synod and demands that he excommunicates the members of the Synod, amongst who bishop Evlogi of Paris. The Patriarch replies that he’s not competent to excommunicate people who are outside the territory of his Patriarchate. February 23: The bolsheviki order to confiscate all ecclesiastical objects within a month and to turn them over to the People’s Commissionary of Treasury. February 28: The Patriarch reacts with an appeal, in which he calls the ukase of the government an act of sacrilege. He calls upon all believers to resist. This appeal of the Patriarch is heard in the entire country. In many cities, towns and villages the believers resist the confiscation of ecclesiastical treasures, which results in bloody confrontations; thousands of people are persecuted, many are executed. February 28: The Russian poet Marina Ivanovna Tsvetaeva (1892-1941), who is befriended with writers like Rilke and Pasternak, escapes from the Soviet-Union, to join her husband Serge Efron in Prague. During the Russian Civil War Serge fought with the Whites against the bolsheviki. When the direct funding from Russia dries out because Holland doesn’t recognize the Soviet-Union, ad- interim chargé d’affaires Paul Poustochkine and his wife, Nathalie Likhachev (1889-1969), try to make a living as art painters. Nathalie is a skillful portrait painter, who was a student in the Academy of Arts in St. Petersburg. Paul earns a little money on the side by selling antiques, while Nathalie designs dresses for the ladies of the Dutch high society. But even with that it’s hard to make ends meet, especially because Paul is still the representative of Russia, and has to pay for all official ceremonies that belong to the obligations of his office, out of his own pocket. Paul Poustochkine: `On behalf of the Dutch government we see after the interests of Russian prisoners of war in Turkey and Bulgaria. In Belgium this task is performed by my Spanish colleague Marquis de Villalobar.’ After Paul’s father Constantin passes away in Genoa in 1922, Paul’s mother, Lydia Vasilievna Poznansky (1864-1957), moves to The Hague. Initially Paul Poustochkine is appointed the diplomatic representative of the Denikin administration, and later of the Vrangel administration. February: The communist member of the Dutch parliament Willem van Ravesteyn utters his displeasure about the fact that Paul Poustochkine is invited to a banquet of Queen Wilhelmina. Jonkheer F. Beelaerts van Blokland, the head of the department of Diplomatic Affairs, tries to persuade Poustochkine into closing down the Russian legation in The Hague, but Poustochkine answers, `Most monarchies in Europe still have Russian delegations with diplomatic statusses. I have always tried to do my work as low profile as possible, without making any fuss. Possibly there will be a day in which one will have to recognize the short-lived administration of the bolsheviki – I am however convinced that Holland will do so as the last country.’ Beelaerts van Blokland yields to this argumentation, and to avoid any criticism from the parliament he no longer puts Poustochkine on the accreditation list as a temporary chargé d’affaires, but as the first secretary. This way he is suspended of the diplomatic obligation to put him qualitate qua in the limelight at every official affair. Queen Wilhelmina is glad to see the back of the Soviet Russians. She says, `You may recognize as much as you like, as long as you don’t expect me to receive the envoy of Soviet-Russia.’ The government understands this point of view. `We don’t want to force the Queen to receive a representative of the ones who brutally killed her relatives – Her Majesty’s grandmother was a Romanoff.’ May 1: Grand Duke Nicholas Nikolaevich Romanoff moves into the Villa Thénard, 66, Boulevard du Cap, Antibes. He uses the name of `Borissov’, which was the name of his estate in Russia. Nicholas Nikolaevich is married to Princess Anastasia of Montenegro. May 5: Patriarch Tikhon officially declares the ecclesiastical supreme council abroad abolished, but the charges of collaboration with the Whites aren’t dropped. May 17: Patriarch Tikhon and his locum tenens Agafangel are arrested. May 18: The traitor Vedensky and his obnovlentsi (`innovators of the Church’) are permitted to visit Patriarch Tikhon in prison, to force him to turn over the leadership of the Church to them. After an hour and a half Tikhon gives in. Paris, December 5: The Soyuz Dvoryan (Union of Russian Aristocrats) is founded. (The union still exists and is resided in Paris, 1 Square the Chƒtillon. The present President is Prince Serge Sergeevich Obolensky.) From Alexandra Rakhmanova’s diary: December 22, 1925: Arnulf just returned from one of his rambles through the city. Tired and low-spirited he dropped on the bed, in which Jurka-Alexander is sleeping. His face is tensed and gloomy. It is absolutely impossible to get a job, whatever you try. Living of the pen is completely out of the question. The editors don’t know which way to turn with all the manuscripts that are dropped on their desks every morning. December 23: John Mott’s YMCA-Press moves from Prague to Paris (where it still is resided on the address 11 Rue de la Montagne Sainte-Geneviève). December 28: The French railroads hired 250 Russian emigrants, who are accommodated in barracks near the station of Clermont-Ferrand. One of these Russian workers says, `Every Sunday the whole population of the town comes to look at us. We feel like monkeys in a zoo. Yet civilization isn’t completely strange to us, because we sing songs of Mussorgsky and others, conducted by a colleague who has been a musician in the Opera of Odessa.’ December 30: Igor Strawinsky visits the United States for the first time. Count Paul Ignatieff, the director of the Russian Red Cross in Paris, is considered an important official and assembles with many important people, like President Herbert Hoover of the United States and other heads of state. His wife Natasha, who lives in Sussex, however keeps thinking of herself as a refugee and stays homesick for Russia. The children grow up as English lads. Paris in the Interbellum In the interbellum more than half of the Russian expatriates who went to France, lived in Paris. Paris, of course, had a enormous gravitational pull, but life there often didn’t come up the expectations of the refugees at all. Eight adults living in one tiny room wasn’t exceptional. The expatriates’ statusses differed. Some were naturalized French citizens, by request or by marrying a French citizen. Others kept the nationality of the first country they went to after they had escaped, for example Yugoslavia or Czechoslowakia. There were also Russians who preferred to keep the refugee status, and they were holders of an identity-card which was called the “Nansen passport”, after the United Nations High Commissioner for the Refugees. In view of these different statusses it is hard to tell how many Russian refugees there were in France during the 1920s. In 1924 the United Nations estimated the number of Russian refugees in France 400,000. In those days there were living about 100,000 Russian refugees in Berlin.